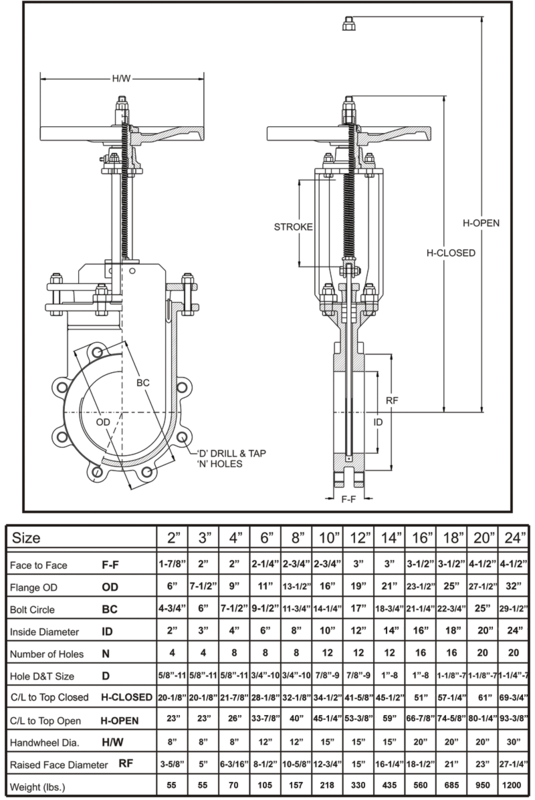 The Fabricast FIG-145 is a unique high performance polymer lined bi-directional drip tight knife gate valve. Designed and tested to mss sp81 and asme b16.5 specifications. 3 piece replaceable polymer liners. UHMWPE (ultra high molecular weight polyethylene) is standard rated to 180 deg F. The seat insert is a T shape that mechanically locks it into the liners. The liners and seat insert are sealed to the valve body with a special silicone sealant preventing the flow media coming in contact with the valve body. The full length body liners support the gate throughout the full stroke preventing deflection and premature packing wear. The packing chamber in the valve body is extra deep utilizing several rows of braided packing resulting in a superior atmospheric seal. ASTM a 240 304 stainless steel gate fully machined and surface ground. All edges are chamfered to extend packing life and to provide a superior atmospheric seal. Liners/insert – Polyurethane 180 Deg F, Polypropylene 225 Deg F, High temp UHMWPE 280 Deg F, Teflon 400 Deg F, Other – contact factory.